The general objective of this thesis is to determine a typology of verbal derivation in Ethiopian Afro-asiatic languages. As a starting point I analyse the major verbal derivations of causative, middle and passive of Oromo, Amharic and Shakkinoono. These three languages serve as representatives of respectively the Cushitic, Semitic and Omotic Afroasiatic subfamilies that are present in Ethiopia. These languages have been chosen because the author has deeper knowledge of them, as a speaker and a researcher. 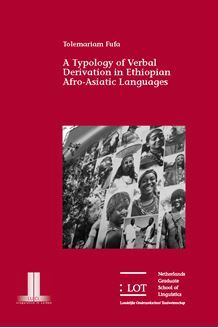 The analysis of the syntax and semantics of the causative in Oromo and Amharic reveals interesting issues such as intransitive causatives and impersonal causatives. Oromo is particularly rich in multiple causative structures and these are analysed in depth. Shakkinoono (and closely related Kafinoonoo) pose some challenges to a descriptive analysis in that thematic stem final vowels have to be distinguished from formely identical causative and middle/passive suffixes. The middle and passive are separate morphemes in Oromo, and Cushitic languages in general, but indistinguishable in Amharic (and Semitic) and Shakkinoono (and Omotic). The meaning ranges of the middle are considered in the three languages. Passives can be made of both patient and agent oriented intransitive verbs which is cross-linguistically rare. The semantics of such impersonal passives are discussed. This study should be of interest to linguists working on Afro-asiatic languages, to typologists and to syntacticians particularly those working on argument structure.